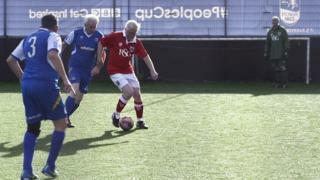 Watch all the action from the first round of the FA People's Cup with Radio 1 Extra's Nick Bright. Some players hadn't played football for years, others were just "Having a laugh". Players of all ages took part and created a great atmosphere across the country. We spoke to some of the more original team names such as - OAP United, Don't Look Bacary Sagna, Grandmaster Flash and the Furious 5-a-side and Boca Seniors. Teams who made it through to the next round don't have long to wait. Take a look at the FA People's Cup semi-final schedule to find out who is playing this weekend.